Endurance Contoured Ranch Pads are cut to fit endurance and western round skirt saddles. Pads are made from ranch tough one inch Wool felt and covered with a durable cotton canvas top and distressed leathers. The contoured spine has a wither relief notch and is reinforced with distressed leather. All pads are 1" thick. The Endurance Round shape has a 16 ½ inch drop making the overall width 33 inches, the seat drops 9 inches, and the spine of the pad from front to back is 28 inches long. The Endurance Square shape has a 16 ½ inch drop making the overall width 33 inches, the seat drops 13 inches, and the spine of the pad from front to back is 30 inches long. This fits my high withered horse excellent. 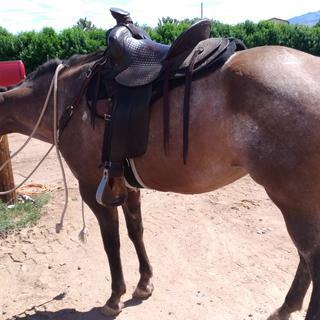 I have a 16” Corriente barrel saddle and it works perfect. Looks great! I have tried multiple pads for my high withered horse who also has a diminished topline. This pad finally did the trick in keeping the saddle up off his withers and not sliding back into the hollow of his back. Pad is thick 1" and contours nicely to horse's back. Well worth the investment. Exactly as represented. I liked what I ordered and received what I liked! This pad looks great and has solved the problem of my saddle slipping. I think it is the combination of being thick and wool. I am so much more secure while riding. Best saddle pad I've ever owned! Stays in place even with a loose girth, and dries so fast you'll be amazed. I love it and so does my horse. I highly recommend it. Love my Diamond Wool pads. This is the second one I've purchased. Now I have one for each horse. If you take care of them these will last forever (well, maybe not quite). I only got the pad a few weeks ago but I've used it for three rides and it's great. I love that the outside is canvas so it stays clean. It fits well under the Casa Dosa saddle I use. My horse thinks it's ok too. We've tried a lot of saddle pads, but this one is the one we keep going back to and is now the only one we buy. I purchased this pad because of the quality material, workmanship and durability that goes into making this saddle pad. The price is reasonable for this item. This pad fit my Specialized Endurance saddle perfectly, is just the right thickness, and I love the fitted curve of the spine - fits my high withered TB cross perfect. Haven't had it long enough to judge durability, but seems to be made well. I ride a horse that I have purchased a specific saddle for and I have borrowed this pad for my saddle to see if it does well for his back. It works perfect. Also it is 100% wool. The wool & poly mix is cheaper but the pad I borrowed is wool and is much more durable. Diamond is the best; wool is to, so it is a no-brainer. I liked the 30 inch length to accommodate my Tucker Endurance saddle. Pure wool and 1 inch thickness, in black filled my needs completely. A discounted price sealed the deal! Looking for a light weight good, sturdy product. Is it thicker in the outlined area or an even thickness throught? What is the deffernce between this and the endurance contour felt pad? BEST ANSWER: The pad is the same thickness throughout. It is just the stitching that makes it appear to be raised. I love this pad. My horse no longer has a sore back on long rides. I have the contour pad. It's an even thickness throughout. It's a really good pad. Does this have spine clearance channel for treeless saddles? I saw a member of staff recommended it for treeless. I would need to know there is a channel and no pressure would be on the spine before ordering? This pad does not have a spine clearance channel per se - it is contoured to fit more closely along the back, and fitting better can often provide pressure relief for the horse's back. You may wish to consider the Pro Choice SMx Air Ride OrthoSport Felt Pad (item E008642). This pad has a breathable Air Rideâ„¢ core, plus a second layer of padding in the dished out areas behind the shoulders and along the spine. This extra padding helps to achieve a better saddle fit and assists in the even distribution of pressure across the entire back, especially relieving pressure from the highly sensitive withers and kidney area. Does this pad have an open spine channel? Contoured spine with a wither relief notch. How would this pad fit with a synagist saddle? BEST ANSWER: It depends on the type of saddle you have and what option-round or square- you choose. Specific measurements are listed in the product description. Where is the 28 inch measurement on this pad? BEST ANSWER: The spine measurement is 28". That is from the front of the pad before the label all the way to the very rear of the pad just after the leather. The felt pad extends a little beyond the long spine leather. In the picture, the spine is the top line of the pad. The 28" measurement is the spine of the pad, good for a short-backed horse like mine. The 28 inche measurement is along the spine. Across the top-line front to back. My saddle skirt is 26 1/2 inches long. Should I order the 30 in long pad or will the 28 in be long enough? If you ride the mountains and use saddle bags the larger pad is better. I have both and like the larger pad better. in the sizes given of a pad, what comes first? the length (spine) or width? Is this 1/2" or 1"?